Here's a peak at one of my side-projects. I've wanted to make a modular synth since I began making sense of synths a few years ago and wrote Caustic's subsynth. Now that Caustic 2 allows for dynamic rack placement of machines, it also expands things for new machines. One of the suggestions that often comes up from gear-heads is the idea of a fully modular synth. I.e one you can make from pieces and connect however you wish. These monsters are great experimenting and learning. I've been working on and off on this prototype since February, bits and pieces in between "serious" coding sessions for the app itself. The plan for this thing is to create a new machine to add to your rack in Caustic, but I'm also thinking of releasing it as a stand-alone iPad app to test the iOS waters. But first I'd like to gather some feedback with a stand-alone PC/Mac version. No fancy installer this time. If you're on Windows, just unzip the package to somewhere on your hard drive and run the executable in the "bin" directory. Presets will be loaded and saved in a "presets" subfolder in the same directory where you unzipped it. If you're on Mac, open the disk image (.dmg) and follow the instructions in the provided text file. This my first ever app for Mac so it's possible I've screwed something up. Let me know if that's the case. No formal instructions either so it's not for the faint of heart, but there are some basic "tutorial" presets to show you how it works. To place a new component, touch a grid square. To remove, select the X button and touch the component to remove. Toggle between the 3 views by using the top-center buttons. You can choose between "front", "rear" and "effects". Front is where the main dials are, rear is where connections are made and where signal gains can be tweaked. The keyboard's note signal comes in as "NoteCV" up top in rear view. The "gate" signal is automatic and hidden, envelopes will trigger on note press. There's a "mod wheel" that will appear if a cable is connect to its output. The app should work with MIDI keyboards on Windows, same as Caustic. Pitch and Mod wheels are hooked up, and so is volumeCC. Velocity is fed through an output signal next to NoteCV, but only varies when using a physical MIDI controller. 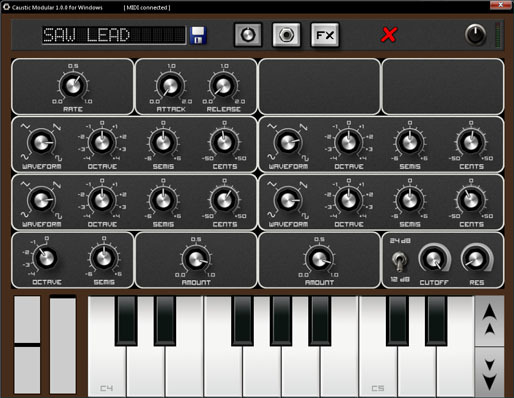 The "effects" view shows a multi-tap chorus, a delay and a reverb effects. These are chained top to bottom, connections are automatic. There's no way to clear the rack of components so I've provided a blank preset to use for this purpose. If you have no idea what any of this means but want to learn, SoundOnSound's Synth secrets is a great place to start learning (it's where I did!). Look at the earlier articles at the bottom, it starts getting more practical at Part 7. Anyway, what I'm looking for right now is demo presets, bug reports and component ideas. Take your time, get to know the program and its components, and learn from the few presets that come with it. When you've got the hang of it and have made some cool-sounding ones, send them to me please. If suggesting new components, please describe whether it is required for an initial release or if it's just another "nice to have" block. I need some demo material to ship with the app(s) and I'm offering a sneak peak in exchange for help getting it ready quicker. Submit any preset files to me via causticapp@gmail.com. Note that by sending me the files, you're handing over all rights to the work, though I will try to offer what I can to those who submit lots, at least a mention in the credits or something. Bonus points for using the velocity and mod wheel signals. Ok, try it out, leave your comments below and let's hear those patches! Page not found when I click download (desktop PC)? Link fixed, sorry 'bout that. Thanks Karl, I'm not sure about Android stand-alone yet, since this is meant as a real-time instrument. It will certainly go into Caustic as another sequenced synth, it's working already, even though it's a bit rough on the CPU still. I'm convince I can get it down to reasonable levels, but maybe a full rack of 6 modulars isn't going to happen on 800MHz phones... we'll see. Thanks for the fix. I'll try and contribute if I can get something decent. Looks cool, will check it out tonight! How cool is this! Things getting very exciting now. Awesome! Keep it up! I have to say - this is great stuff! The Big lead sound was very phatt and moogy and was waiting for the cutoff! Plucked string is also great.....so versatile. FM and Glass sounds as well......very nice. This is surely the best thing to come out of your workshop yet! I love the look of it as well! It's like using a mini pocketphone Creamware modular synth.......it's so cool. Well done to you all. Now you must incorporate it asap into Caustic! Imagine the techno tracks and ambient soundscapes......cor! Stuff Fruityloops! Nanostudio users take note - there is a new kid on the block and he means business.......what a great bit of news for the summer this synth is! Yeh the modular synth was far ahead of it's time ( the Creamware one ). It was very well designed. I will try to have a go at doing some sounds for you.....I think you are right - there's nothing like having a big bank of sounds to use from the word go. I think just let people play with it and see what they come up with......it's half the fun. this is AWESOME!! absolutely cannot wait to get this going on my android! Playing with this now, I love this thing!! just what ive been wanting for caustic!! can i test it on my android rej? PLEASSSEEE?!?!?!?!?! You have to realize the version you'll get in caustic won't have a keyboard. You'll be playing it strictly from the sequencers. So while it's not impossible to design patches from caustic, the stand-alone version is a much better tool. Oh, and the effects won't be built-in to the synth either, you'll have to re-add them yourself as inserts. A complicated patch still takes up ~25% of the CPU on my phone so there's still a lot of optimization required before this can ship... don't expect this anytime before December on Android. Oh, and just to be clear, there exists no stand-alone version for Android yet. This is really nice! I like how you actually have to wire the keyboard and envelopes to make it playable. Much more realistic than a lot of software modulars. I just downloaded this Modular and I am very impressed. Really awesome program. Please bring this to Ipad, I will buy it the day its released. If you could add core midi it would be amazing.. Im sure this would sell very well. I also downloaded the Caustic Win32 and its another great program! You are obviously a very talented programmer Rej! I will spend some time creating some patches for Modular, and thank you for making this available for people that don't have access to android devices like me. If you do end up merging Modular into caustic, that would be fricken wicked. I have only been using Caustic 2 for a couple weeks, but I LOVE IT! Best music software out for Android, and I am wicked excited about the possibility of having a modular Synth thrown into the mix, I played around with you beta version and have to say it is awesome! I was thinking you may even want to look into making it or some of your other Synths in to "Rack Extensions" and selling them on Propellerheads.se you have got some great stuff and I definitely don't want to stop you from writing for the Android OS because this is easily the best software out there for making music for that platform. Keep up the great work and definitely left us (the Android Community) know when the Modular Synth will be out - heck I would even pay for another unlock key for the it! Very cool. This synth would be awesome within Caustic.One suggestion would be to add colors to the cables. Different colors for different cables could make it easier to see what is going on within a patch. understood,, still anticipating it with much anxiety and excitement more and more each day!! this modular synth and an open rack will really take caustic to new heights! I just purchased Caustic 2 for my playbook and I love it. 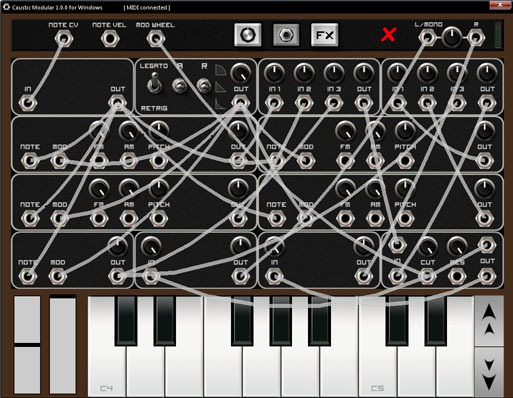 Would love to see a modular synth on this awesome app. I don't even know where to start with! There are no sound when I touch the keyboard! Some of the input mixers are just blanks. My word, that looks awesome. My word, that looks awesome. I've not got it to make a noise yet, apart from loading one of your starter patches. Better follow your tips, read some stuff, and have a play. I'm a bit late to the party but I just downloaded this and DEAR GOD it is amazing. Great work, as always. That's a great job !!!! Very nice !!!! wow, this is really look great, you make this for musician. and i really appreciate it. your work is really great thanks for share with us.